The maiden flight of Taiwanese low-cost carrier V Air from Taipei to Manila arrived at around 7:45 p.m. Sunday with over 70 percent load factor from Taiwan Taoyuan International Airport. This marked the beginning of V-Air’s Manila to Taipei service which will operate four flights weekly every Tuesday, Thursday, Saturday and Sunday. A travel to and from both cities is estimated at one and a half-hour to two-hours. 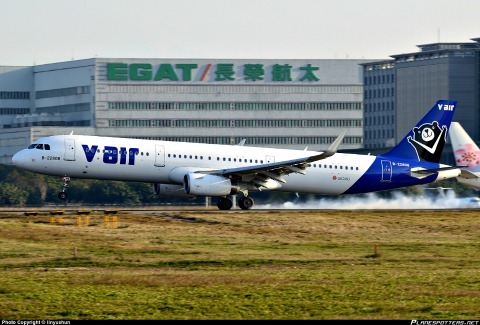 In a press conference Sunday night, V Air Chief Commercial Officer Bernard Hsu welcomed the airline company’s ninth and latest service noting the huge market potential in the two countries. “We believe there is a huge market potential between Taiwanese and Philippine market. We offer four roundtrip per week initially but we hope we will increase frequencies in the coming future,” Hsu said. He also expressed hope that the airline company will eventually become the preferred airline of the traveling Filipino on a budget. “Our operations in Manila will be significant in securing a strong foothold in the region,” he added. Ambassador of Taiwan to the Phils. (TECO) Gary Song-Huann Lin, for his part, echoed Hsu noting that the inaugural flight was a good follow-up to the amendment of the aviation agreement between Philippines and Taiwan in 2014. “We have enhanced the passenger capacity of our air services between the two countries. We would like to support President (Benigno) Aquino III’s important policy which is to boost tourism,” he said. The ambassador said that an estimated 200,000 Taiwanese tourists visit the Philippines annually. On the other hand, there are some 150,000 Filipino tourists who visit Taiwan annually. Manila International Airport Authority (MIAA) Assistant General Manager Vicente Guerzon, meanwhile, expressed hope that the partnership increases collaboration between the two our countries. “I hope this provide network opportunities to work together in facing challenges of civil aviation sector in this country,” Guerzon said. “More flights to the Philippines means more jobs. We in MIAA are so grateful to our airline partners for continuously operating flights to and from Manila,” he added. The airline mascot is a Formosan black bear that bares a V-shape chest mark on its fur. It is also known to be energetic and curios like young travelers.